My Pulp Nazis are negotiating with the Radon Zombies to get Flying Saucer technology that will win the war. As a result, I needed a Flying Saucer. There are a few commercial kits available, but my local shops don’t carry any of them. They are also a bit expensive for a terrain piece I’ll probably never use again. I went to the local Dollar store, and looked in the housewares section. Sure enough, I found two bakelite plates the right size. Bakelite is a hard plastic that accepts crazy glue and paint well. The hardware/gadget section provided a touch light: A dome that lights up when you press it down. I glued the two plates together. When dry, I sanded the centre areas smooth. I drilled three holes for the legs (flight stands from SPACE 1889’s Sky Galleons game) and glued them in place. I added four flight stand bases as random detail. The body was spray-painted silver, as was the lower ring of the touch light. 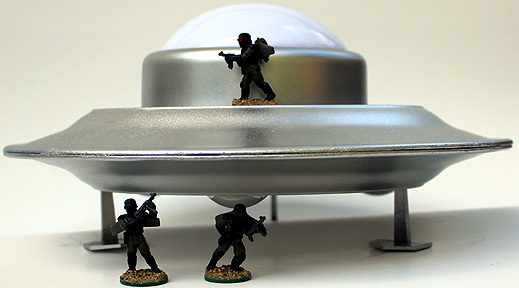 To retain access to the batteries, the touch light just sits loose atop the saucer base. The saucer has the tall-tower look of early saucer sightings, and a similar lack of greeblies and small details. The light-up dome provides amazing special effects at a low price: The plates were a dollar each, and the touch light was two dollars. It may not look like a million dollars, but I’m trying to re-create pulp films. They didn’t have a million dollars either. This unit is based on a description of Early German Askaris in Foundry’s ‘Small Wars and Skirmishes.’ It’s made of Old Glory Egyptians painted as Africans, with a German flag. It has Egyptian Officers, as the troops hired only understood commands in Turkish, so non-German officers were needed. The Egyptians and the Sailors below had a few of the ‘Hey Bob!’ poses, with heads looking around at odd angles, but they were easy enough to fix. A naval landing party. Old Glory again, Austrian sailors from the Boxer Rebellion. If there is a difference in the uniform, it’s lost to me in 25mm. Renegade WW1 Germans in field cap, with a neck curtain added.The uniform might not be 100% correct, but it looks good enough to me. (The caps should have a small visor on the front, but I didn’t bother) They’ll also do for troops serving in Asia. I also made a MG and crew. The funny little tripod is made from wire and plastic card. I found the first Captain America movie to be quite inspiring, I wanted to make a Captain America-style scenario, but with a pulpier feel. There were several serials that I liked, and I figured I’d grab elements from a few and throw them together. The scenario is a simple one: At a secret base, Nazis are meeting with the Dreaded Radon Zombies, who are going to give them Flying Saucer technology that will win the war. The Spy Smashers have to prevent this happening, and either destroy or capture the saucer. 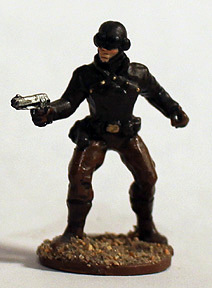 Unless otherwise noted, all miniatures are from Pulp Figures. The Evil Mastermind, Stahlhelm, with his two best operatives. He’s a Master Spy, and she’s a deadly Assassin. The Glorious leader, with guards, and several officers. Is it really him, or a double? Either way, punch him for extra glory! Some of the She-Wolves. (There are plenty more) They are ruthless and efficient, and quite merciless. Right, the Glorious Leader’s girlfriend. A Foundry ‘Street Violence’ figure that just had the perfect look. Centre, Little Freyja, a Teen She-Wolf and SMG enthusiast (from Hinterland) and left, a FlugelJager. (There are a few more of them.) His red eyes got lost in this picture. 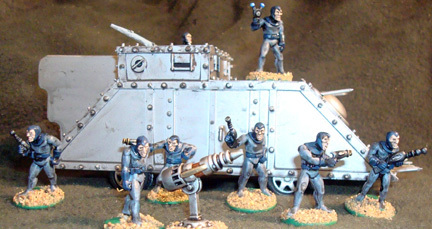 Sturm Troop Clones, the backbone of the defense. Big, faceless, and armed with high-tech weapons that they use with a stunning lack of efficiency. (and yes, there are plenty more of them.) These are Wargames Factory plastic Shock Troops. I really had no idea what to do with these figures until this scenario, and then I was happy. They were perfect. They actually were clones of each other, and looked like Comic Book Germans..
Three of the Spy Smashers: A Heroclix miniature, a Pulp Figure, and a Reaper miniature. I mentioned my vicarious participation in a VBCW campaign by making and sending troops and equipment to the fray. This is an earlier contribution, a fearsome tank. Details may seem crude, but there is a reason for that, aside from my crude modeling skills: I was trying to give it the look of an interwar diecast toy repurposed for wargaming. My main references were therefore pictures on eBay. Some finer details are copied from an Airfix kit, but as you see, there are not really many finer details. The turret and treads are from an Italieri snap-together 1/72 Sherman. The treads are shortened by one set of bogies, and meaningless interwar-looking details were added in an attempt to disguise them. The hull is made from Lego pieces, turned upside down, and with a top plate added. Rivets are pin heads, crazy glued in place. The hatch is a tiddly wink. Turret details were removed. I used the gun mount supplied, but built a new mantlet and gun(s). The smoke dispensers are pieces of sprue, and the commander’s cupola is a tiddly wink atop a slice off the bottom of a gaming pawn. I painted it a bronze green to simulate the old Dinky Toy colour scheme, with a yellow-green gas paint swatch. I think it looks quite toy-like, as I intended, but many interwar AFVs did, too. The ‘Police’ markings were added by its new owner, as it is part of his Police forces. He has yet to field it, possibly because he fears to arouse jealousy in his companions. A friend of mine in the UK is involved in a VBCW campaign, and I am quite jealous of him. It sounds like a lot of fun. I am participating vicariously by building support pieces and vehicles and sending them to him, in an effort to pretend I’m involved somehow. His forces have a mortar section manned by Spanish Civil War veterans from the P.O.U.M., so I made him an armoured lorry crewed by the even more fanatic wives of the P.O.U.M. The basic vehicle is a Lledo piece from eBay. I found one with a good price and low shipping and bid on it. I then found another that was cheaper and had cheaper shipping, and said ‘Buy it Now.’ So I can only advise you to read all the listings before choosing. And yes I won the other auction, so I bought two lorries. All modifications were done with plastic card, glued on with cyano adhesive. Armour plate was added to the doors and windows, and either sliding or hinged shutters over the vision slits. There’s also angled plates over the radiator. I copied all the features from various home-made armoured cars of the era. The markings were copied from P.O.U.M. vehicles in Spain, except for the skull & crossbones. That just seemed fitting. 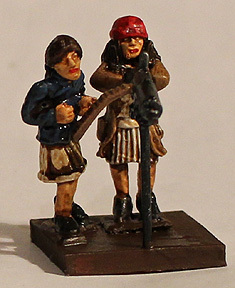 The crew are modified Dunwich Detective females, available from Spacelords & More. 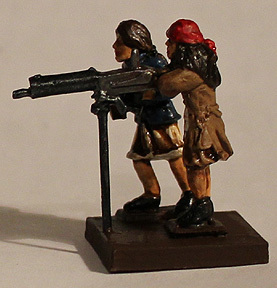 They’ve had long hair and headgear added, and the gunners have had new arms ineptly sculpted. They are placed on sabots so you can place the guns facing whatever arc you choose. They are supposed to be pushed against the wall, even though I didn’t always do it in the pictures.